DETAILS: You will enter this Camp District home through a charming screen porch outfitted with a swinging bed and an awesome outdoor dining table, perfect for dinner al fresco! 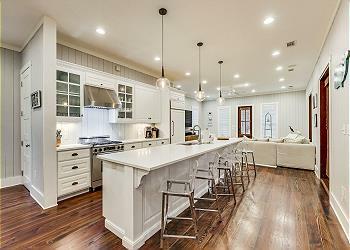 Enter into an open living space wrapped in fresh shiplap and lightly stained hardwood floors. This floor plan connects the living room, dining room and kitchen. With all stainless steel appliances, huge pantry, marble counter tops and ornate tile work, this kitchen is fit for a master chef. The first floor includes one stunning guest bedroom. The first bedroom gives you a sneak peak of the unbelievable design work put into this home. It includes a king bed and an ensuite that will easily be mistaken for the master! The remaining Main House bedrooms are found on the second floor. The first bedroom on this floor is equipped with two twin beds and a charming bathroom with floor-to-ceiling subway tile. Connecting this bedroom and the full bedroom is a convenient kitchenette, perfect for a midnight snack or refreshment. The final bedroom on this floor is the master suite, complete with a king bed and a bathroom featuring a double vanity, modern tub and massive separate shower. 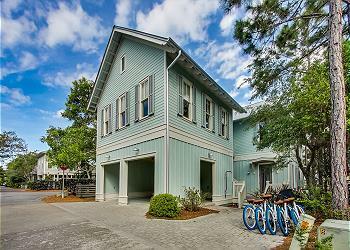 Just off the main house you will find a private carriage house retreat! The bedroom includes a king bed and is separated from the living room by a charming, adjustable shade, allowing you to open up the space or close it off for privacy. The carriage house also includes a private bathroom and well-stocked kitchenette for your convenience. We had a great time at this lovely beach home. 9 family members stayed for our annual Christmas family trip. The location was perfect for everything we wanted to do. Short, easy drive to anywhere in and around Seaside. The bikes were a hit even though the weather didn’t cooperate every day. We went on group and individual rides. The house was beautiful with everything we needed. Very clean and gorgeously updated. We used the fireplace on the porch everyday and ate outside twice. We watched football, played games, and had plenty of room and privacy for everyone. Our 5yr old granddaughter and her parents used the carriage house , and she loved staying in “her own apartment”! The pictures don’t really do this house justice as to how lovely and spacious it is. We are so delighted that you enjoyed your stay with us in Watercolor! We could not agree more that this house is in the perfect location and is the accommodations are hard to beat! Thank you for staying with 360 Blue, we hope to see you again soon! House was beautiful and sparkling clean and had so much space. We had 8 people in our group and easily could have had more. Plenty of bikes were included. Separate ice maker at bar was a huge plus being at the beach. We are so glad that you and your group had a great stay with us in Watercolor! We completely agree that this home is a wonderful option for a fun and relaxing getaway! We hope to see you all again here soon!